Your guide to selling internationally. Read on to learn more. Whether you’re new to selling overseas or already a pro, it pays to have a plan in place. We’ve outlined five critical areas to consider when planning for international growth. Identify which countries/regions to target and research the unique aspects of each market. Make sure consumers have confidence in using their preferred method for payments. Understand local laws, duties, taxes, customs, and free trade agreements. Make sure that your policies on international shipping, delivery, returns, and payment are clear and easy to find. Generate demand by building brand awareness and taking advantage of local trends and holidays. Globalization and internet adoption are creating opportunities for small businesses to reach new customers abroad. of cross-border shoppers cite "better prices" as their top reason for why they shop internationally. **Source: Forrester Research, Online Cross-Border Retail Forecast, 2017 to 2022. A PayPal and Ipsos research provides insight to the popular shopping destinations, what and why do customers buy overseas, and how they pay. PayPal is widely and frequently used for cross-border online shopping. 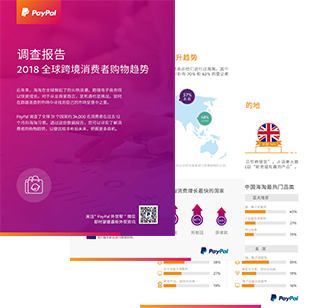 Nearly 70% of online cross-border shoppers preferred to use PayPal for their overseas purchases. A truly global payments platform available in more than 200 markets, allowing customers to get paid in more than 100 currencies. Global research examines the online shopping habits of over 34,000 consumers in 31 countries/regions and provides merchants key insights to expand global sales. Ready to start or expand your international sales?